Canara Bank has released the Interview call letter of the Probationary Officer Exam 2018-19. The candidates who have qualified the exam can download their call letter for the next and final phase i.e, interview round. 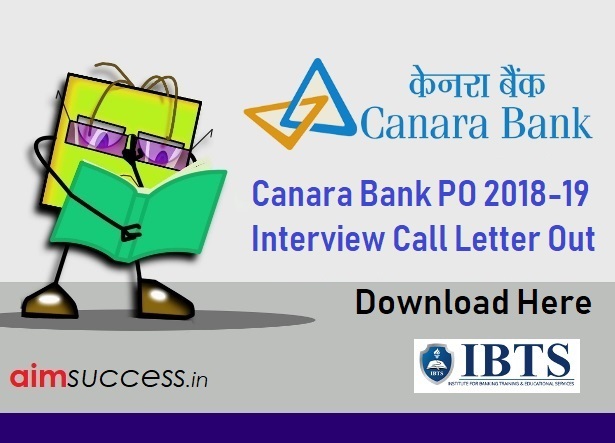 Canara Bank PO Interview Call letter, Download now! Visit the direct link given above to download your interview call letter. Login and interview download call letter. You can also check the schedule of Interview and GD of Canara Bank from the given link. Canara Bank PO Interview & GD Schedule 2018-19, Check here! All the Best for Canara Bank PO GD and PI! !, For Practice & Training for Bank Exams & coaching for best preparation for exams.